The average American consumes less than 2.6 cups of fruits and vegetables each day. This is far less than the United Stated Department of Agriculture's recommended amount of 4.5 cups as described in the 2010 Dietary Guidelines for American. Fruits and vegetables are especially important for young children as they provide many important nutrients for growth. It has also been established that children who learn to like a variety of fruits and vegetables when they are young are more likely to enjoy those same foods throughout life. For this reason, the University of California Cooperative Extension (UCCE) Nutrition BEST (Better Education, Skills and Training) program, with the support of First 5 Placer County, has worked with the Natural Trading Company farm, located in Newcastle, CA to provide Early Head Start families with weekly Community Supported Agriculture (CSA) produce boxes during the summer. Along with their weekly produce, families get recipes and sample dishes made from the produce found in the weekly box. Families report that because of the CSA program they are preparing, cooking, and eating more fruits and vegetables together. During this program, families also participate in a farm tour at the Natural Trading Company. There they get to meet the farmer and learn about how fruits and vegetables are grown. Children are encouraged to pick and taste produce and to experience other elements of farm life, including the chicken coop, the pig pen, and goats grazing in the fields. Families enrolled in the program receive additional education by UC CalFresh Nutrition Education Program on how to plan, shop, save, and cook low cost nutritious meals. UCCE Master Gardeners provide additional gardening education to encourage vegetable gardening at home. This cookbook was developed as a way to compile all the recipes that were tasted by participating families throughout the season and to encourage participants to continue serving fresh fruits and vegetables to their families. Along with recipes, the cookbook includes informational pages about a variety of different fruits and vegetables found in the CSA boxes. It also provides insight into the CSA program and how participating families were given opportunities to explore new and healthy food experiences. The cookbook is designed to support the other educational components of the program by keeping recipes simple, low cost, and by utilizing vegetables that can easily be grown at home. We hope you enjoy the cookbook and all it has to offer. 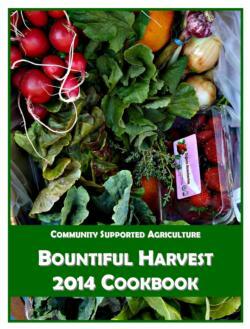 Please use it as a tool to explore the bounty harvest grown in Placer County and to share this with others. The cookbook is broken into different sections for easy of downloading.